After many months and promises of almost having it ready I'm happy to say the pattern for the Crochet Brioche Sweater is ready! Made using between 550-615 yards, 503-562m (4.5 skeins for S/M, 5 skeins for L) of Magnum by Cascade and Q/15.75mm hook this piece works up quickly and would be a good 1st sweater project for an advanced beginner to tackle. Nothing too complicated with this one... minimal increasing at the bottom waist section is probably the most complicated part. I adore this! But before buying the pattern I'd like to be sure I am clear.... the middle picture is different and looks like an entirely different pattern. I also like it even more than the one I went to buy.... so the question is..... where is the pattern for that one? Amazing work, all of your work!!! So I'm a size 16 woman with a large bust -- the model (is that you) is very slim -- what do you think this would look like on a bigger woman? I really like the color that you used. Can you tell me what color that is? Thanks! It's color #0010. A great winter white! I love this pattern and purchased it last weekend. I was not familiar with Magnum yarn and did not realize that it has a fuzziness to it. Could you recommend another yarn to use? The owner of my local yarn shop suggested Malabrigo chunky. I am wondering what you think. Any suggestions would be very appreciated. Magnum isn't tightly spun so yes, it does have a bit of a fuzz to it. The Malabrigo chunky I don't think is thick enough. They have a yarn called "Rasta" but I think it's a single ply like Magnum and might have that fuzziness as well? Not sure. 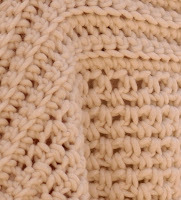 Brown Sheep makes a yarn called "Burly Spun" that's spun a little bit tighter OR as much as I hate to steer you away from a LYS my sister made the knit version of this sweater using Lion's Brand Wool Ease Thick & Quick. It's thicker than the Malabrigo chunky and works well with a U hook... you might want to check that out. Hope this helps! I bought the Magnum Capelet pattern and used Lion Brand Hometown USA yarn and it came out beautifully!!! So soft! I can't wait to buy this pattern too! Good to hear Mindi! I just used that yarn for the first time a couple of weeks ago and it is so soft! Happy New Year! Does the pattern with pic instructions or graphics? 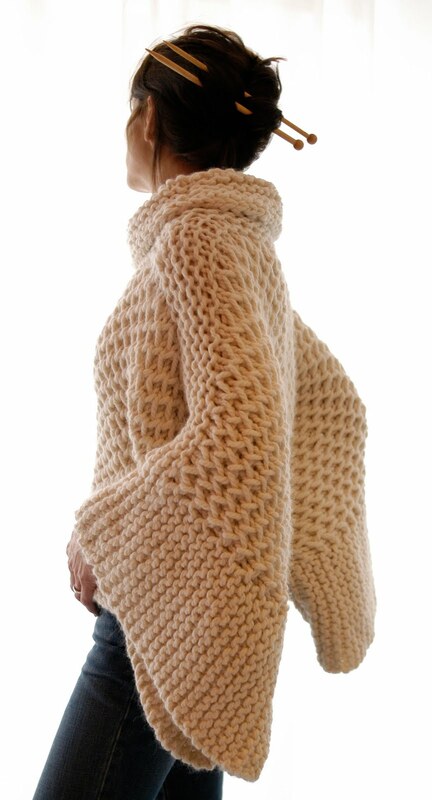 I love this sweater, but am a little unsure about the sleeves. Can the pattern be adjusted to make regular sleeves? Thanks! Awesome! I just purchased the pattern & I'm off to the yarn store. Can u share a pic of the arms open? I'm wondering how much a leave there is. Sure! Will post a pic soon. Hi Nicole, the suggested yarn is a single ply that is really chunky. I made a kid's version as a prototype before making this one so I could help you adjust it to fit your frame. There is very little shaping so it won't be hard to adjust. Hope this helps! Do you think it will work with a thinner yarn? I have some amazing alpaca yarn that I have been dying to use.It is very thin you use a size 4 hook with it. Hi I am from Peru, and I love this kimono would love to know how they are called the points used for this work, greetings from Peru. Is there any other yarn that is non specialty you can recommend? Hello. My wife is in love with this sweater. Her Aunt knits, not crochets. Could she use this pattern to knit this pattern - convert from crochet to knit? Hi, like Angelica, I am a size 16 with a large bust. Could you provide finished measurements? 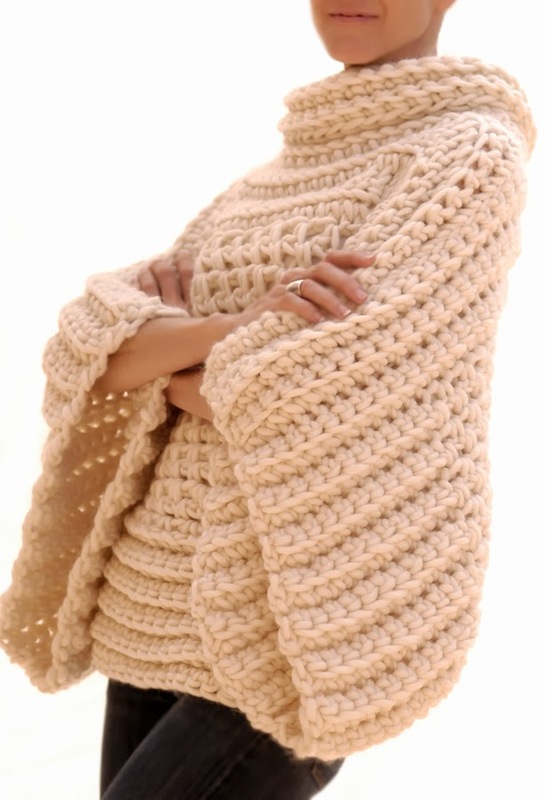 I'd like to make sure this will fit me before I buy the pattern and yarn. Hi Karen. I am a beginner and love the sweater. I've completed the sweater but I've unraveled the waist and redone it 3 or 4 times. On the odd rows do you still do the increase at the side where the seam will be sewn? Or is that just the sc, turn, sc? Hi Monica, Good to hear (except for the unraveling part ;) So are you making increases on your odd rows? You only want to increase every other row... so if you are increasing on your odd rows yes you want to increase. You have to make 4 increases per increase row: one at the beginning of the row, 2 in the middle of the row and one towards the end of the row. 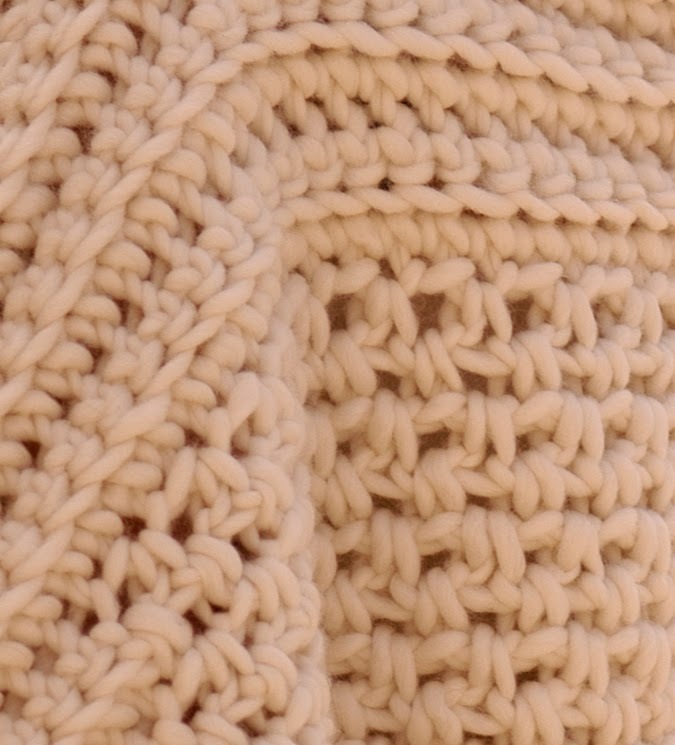 The first increase could be made 1, 2 or 3 stitches in from the beginning of the row. Say you make your increase 2sts in, then the middle increase will need 2sts between them and the last increase will be made 2sts from the end. Does that make sense? Where ever you place them they have to be even because if you think of that piece being folded and the increases are at your sides. Hope that makes sense!! Hi Ma-wissa, my only hesitation in saying the P hook would work is that it might make your stitches a little on the tight side. I would make a swatch first to check and if it looks like the stitches are too tight then I would try to work them on the loose side. I hope that helps! Email me and I can answer your 2nd question better. info@knit1la.com thanks! Hello. I know this is a really old post, but I've incredibly interested in making this sweater and just wanted to see if I had any issues if you'd be able to help me. Thanks! I'm in LOVE with this sweater. I'm a beginner/intermediate but I've never made a garment before. I'm a plus size girl so I'd need to increase the size. Is this a pattern a newbie to sweater making could figure out? 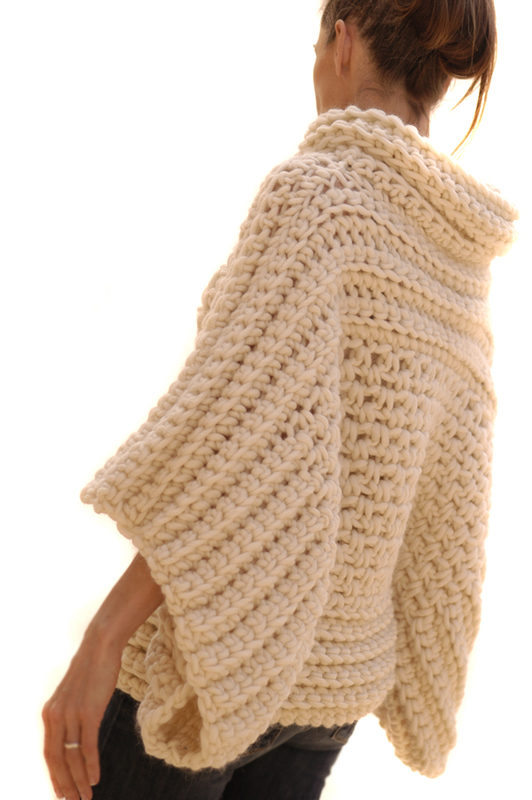 I'm dying to make this sweater! Can this be made with a worsted weight yarn?